It only took 3.5 years. And demotion, losing his Shadow Finance Minister portfolio. But in the end, the truth will out. The worm has begun to turn. And some economic “experts” are beginning to agree. GILLARD Government debt levels are forecast to blow out by 80 per cent to $165 billion in this term alone – equal to more than $14,000 for every working Australian. Analysis of Budget documents reveals that between the 2010 election and Federal Treasury’s update in October last year, the 2012-13 net debt estimate rose $54 billion to $144 billion. With Wayne Swan having junked the Government’s commitment to a surplus this financial year, Bank of America Merrill Lynch now forecasts Treasury will raise the estimate by a further $21 billion in the May budget. Mr Swan’s spokesman said the Government had no plans to raise the gross debt limit. Mr Eslake said the increase that had already occurred was “troubling”. “If the trends that look increasingly obvious aren’t addressed at some point we might cross that threshold from safe territory to dangerous territory very, very quickly,” he said. Monash University Professor of Business and Economics Jakob Madsen said the gross debt rise was “disturbing”. “It’s a dangerous trend and it’s at the wrong time. Business Council of Australia CEO Jennifer Westacott said spending had grown “out of step” with revenue. 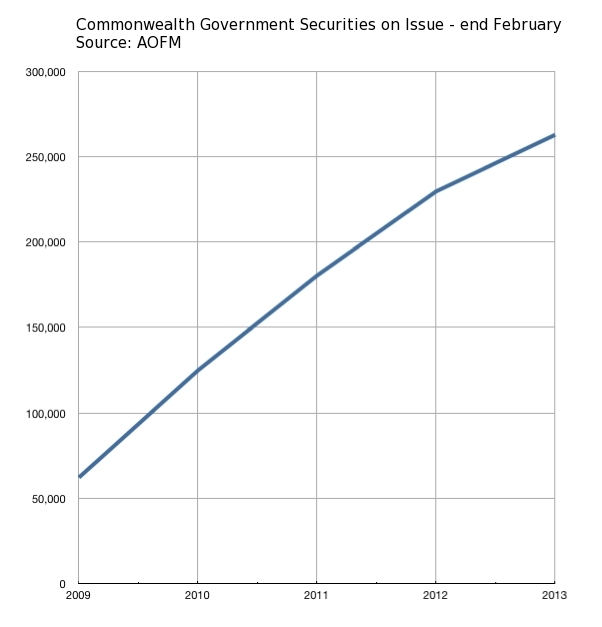 “If that doesn’t change we are going to have serious public debt problem,” Ms Westacott said. Mr Eslake, Professor Madsen and Ms Westacott all said Australia did not currently have a debt crisis. But, Ms Westacott said, “we do have a budget management crisis”. Shame these “experts” did not notice this problem and speak up earlier. Have we not had to endure 5 years of constantly being told that the ALP government have given us “sound economic management”? Do not be misled by all those who (still) downplay the importance of Australia’s government debt position. Do not be misled either, by those who – intentionally, or accidentally – distract from and dismiss the importance of ever-rising government debt, when they (quite correctly) point out that an even bigger problem is our world-leading private debt. Australians should never forget that, prior to their real estate (private debt) bubbles bursting, Ireland and Spain were considered the “outstanding” economies of the EU. FIVE years ago, a survey of the euro zone would have shown two star countries. They were growing rapidly and running government budget surpluses. Their national debts were low. Other countries sought to emulate their success. The outstanding countries were Spain and Ireland. At the time the two economies appeared to be impressive, there was one indication that could have provided a warning. Each country’s private sector was borrowing heavily overseas. Those loans were fueling rapid economic growth that, in turn, produced rising tax collections, allowing national governments to run budget surpluses. Which is almost exactly the same situation Australia is in. For many years our massive banking sector – now bigger by market cap than all of Europe’s combined – has borrowed heavily overseas to finance our world-leading overpriced housing bubble. It does not take an “expert” economist to see what the future holds for us. Just “a little ol’ country accountant”, with the courage to speak up and call it as he sees it. ONE of the nation’s top financiers yesterday joined the debate on the country’s rising debt level – describing it as dangerously high. AMP chief economist Shane Oliver also urged the government to stop using economic comparisons to countries in Europe and the US to justify a predicted 80 per cent blowout to $165 billion this term. “It just shouldn’t be this high,” said Mr Oliver, who said the government hadn’t taken advantage of the decade-long resources boom. Read an article that questioned the almost folklore anti-banking, pro-citizen approach Iceland took to it’s banking crisis. The article argued the Icelandic government initially looked at bailing out the banks but given the size of the problem, the Government simply couldn’t do it and cut them loose – which is they should have done! I read the same. Sounds quite plausible too, methinks. I’m not a fan of the Bitcoin system. IMO, it is seriously flawed, on several levels. Of course there are still some who think there’s nothing to worry about. Larry Pickering should have something which will put a smile on your face.